Team finds gold in eucalyptus branches and leaves. Aspiring gold prospectors may want to trade their pickaxes for chainsaws. A group a researchers from Australia’s Commonwealth Scientific and Industrial Research Organization (CSIRO) has detected trace amounts of gold in the branches and leaves of eucalyptus trees growing in the Outback. Their findings were published yesterday in the online journal Nature Communications. Scientists discovered that certain eucalyptus trees’ roots were able to absorb minerals from as deep as 30 meters below the ground. In areas where gold may be present, the precious metal can be sucked up and transferred to other parts of the tree. 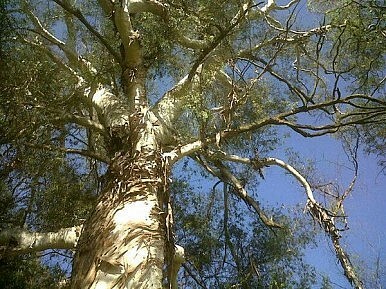 The eucalyptus trees that CSIRO researchers studied were located in the Kalgoorlie region of Western Australia – ground zero for the country’s late-1800s gold rush. Before you get any ideas about chopping down eucalyptus trees, it should be re-stated that only trace amounts of the yellow metal were discovered – 80 parts gold for every billion parts leaf. Scientists involved in the study said that it would take 500 trees to produce enough gold for a single wedding ring. The CSIRO team may have discovered a way to make finding gold a lot more “green.” While the miniscule particles of gold found in a eucalyptus leaf may not be very valuable – finding it may give prospectors a big hint when it comes to choosing a dig site, without actually having to dig. “Not only do we believe it is a way of stretching the exploration dollar further, because exploring for these deposits can be quite expensive, it also minimizes the damage to the environment because we are taking a very small sample from the trees themselves, as well as the leaves and twigs on the ground,” Lintern added. The World Gold Council believes that more than 174,000 tons of gold have been mined since the beginning of civilization. Currently, the U.S. Geological survey estimates that 51,000 tons of gold remain in international reserves. However, new discoveries of gold have fallen by 45 percent in the last ten years, causing prices to skyrocket. “The cost of the yellow metal shot up by 482 percent between December 2000 and March this year,” said AFP. Researchers added that their method for cheaper, eco-friendly gold prospecting could also be used to find iron, copper and lead. Mercury Treaty: Hope for Child Gold Miners? How the Japanese town of Minamata is linked to efforts to end exposure to mercury everywhere.